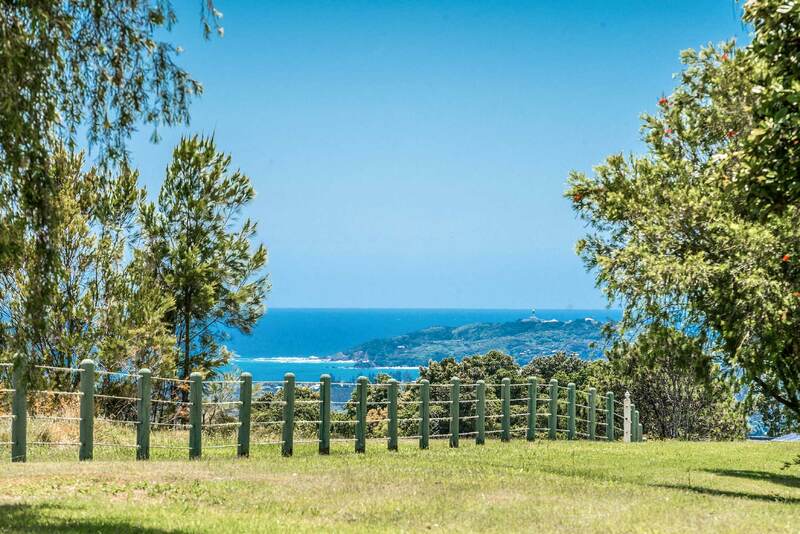 Named for its uninterrupted ocean views, Pacific Ridge is perched high on a hilltop overlooking Byron Bay. 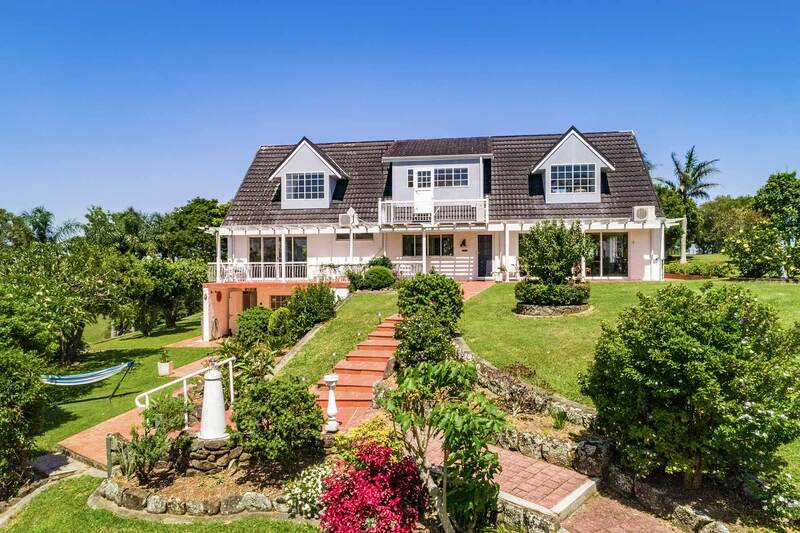 With 4 spacious bedrooms, 3 bathrooms, and an open floor plan, this cherished, Cape Cod inspired home is ideal for family groups or reunions. The large kitchen has been recently renovated and restyled, as have the dining and lounge areas. 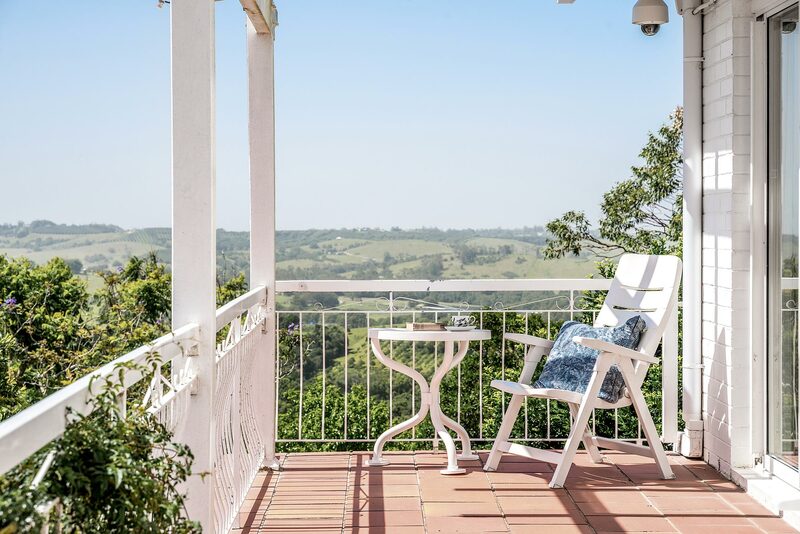 Step outside onto the manicured lawns for stunning views to Lennox Head, the Byron Hinterland all the way up to the Tweed Coast; or take a short stroll down the path to the veggie garden to enjoy the best views in Byron! 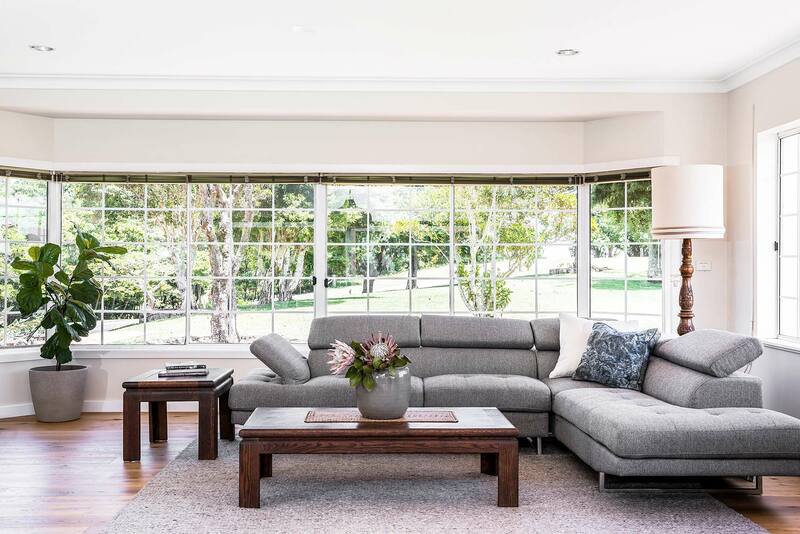 The open-plan living space is a spacious, relaxing retreat for family and friends to gather together. With an oversized, plush sectional sofa and Netflix-enabled Smart TV, it’s easy to unwind in the comfortable lounge area. 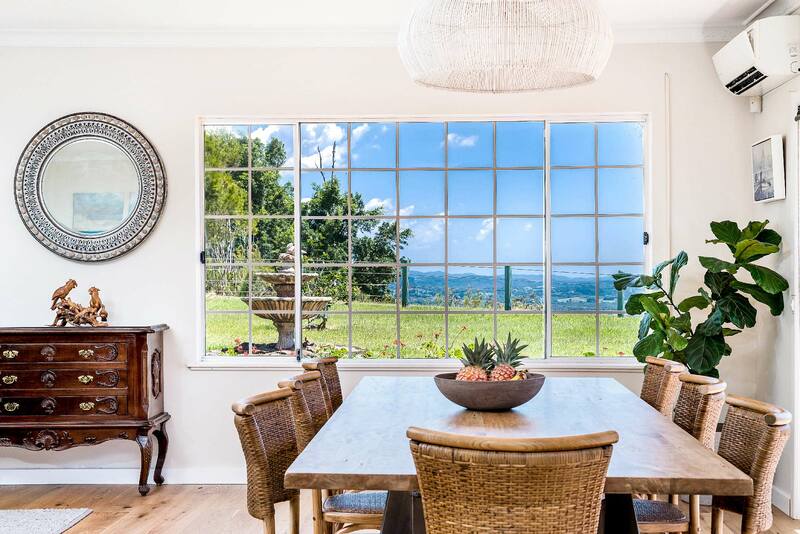 Natural light streams in through large windows, which perfectly frame the stunning views of the lush, rolling hinterland. Bright, modern, and expertly restyled, this immaculate chefs kitchen boasts gleaming granite countertops and natural wood floors. Stainless steel appliances include a dishwasher, refrigerator with freezer, microwave, gas oven and range. 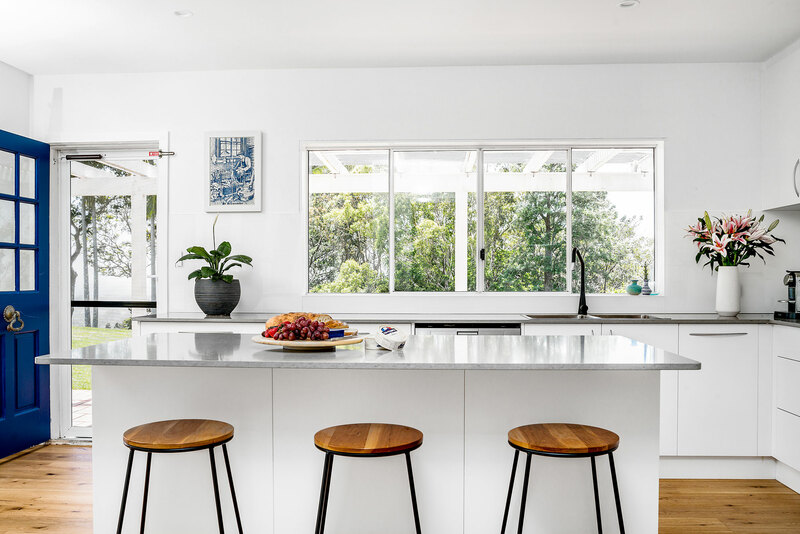 The centre island with breakfast bar seating for 3 is the perfect place to perch with your morning coffee, fresh from the Nespresso machine with provided pods. Just off the kitchen is a formal dining space with a large table for 8, opening onto the back porch through sliding glass doors. 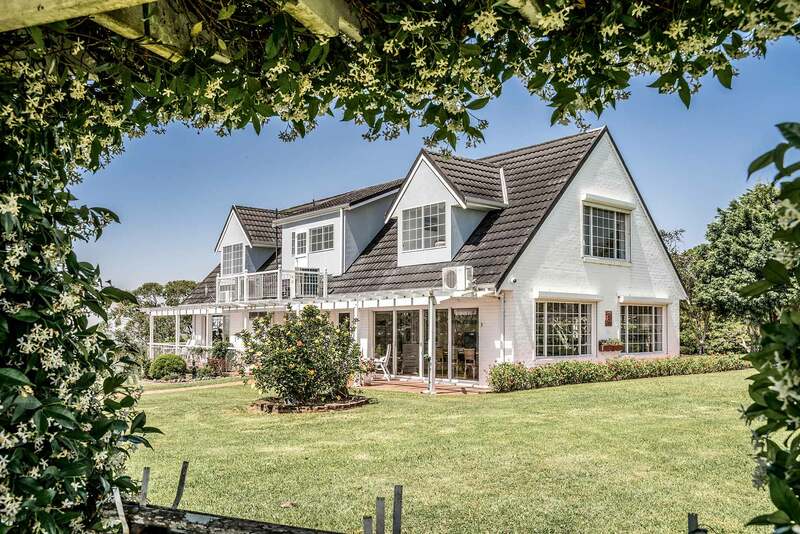 The 4 bedrooms at Pacific Ridge are spread out across both floors of this warm, family home. 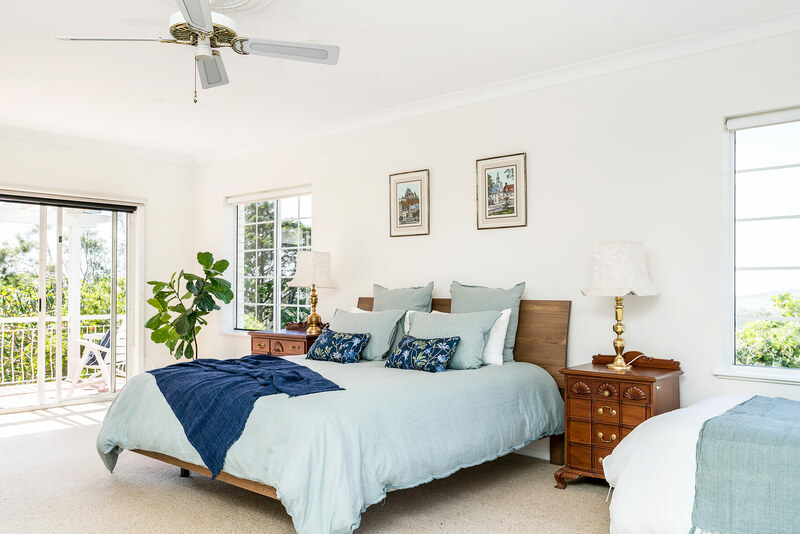 Downstairs, the master bedroom is spacious enough for a couple and child, with 1 king bed and 1 single bed. 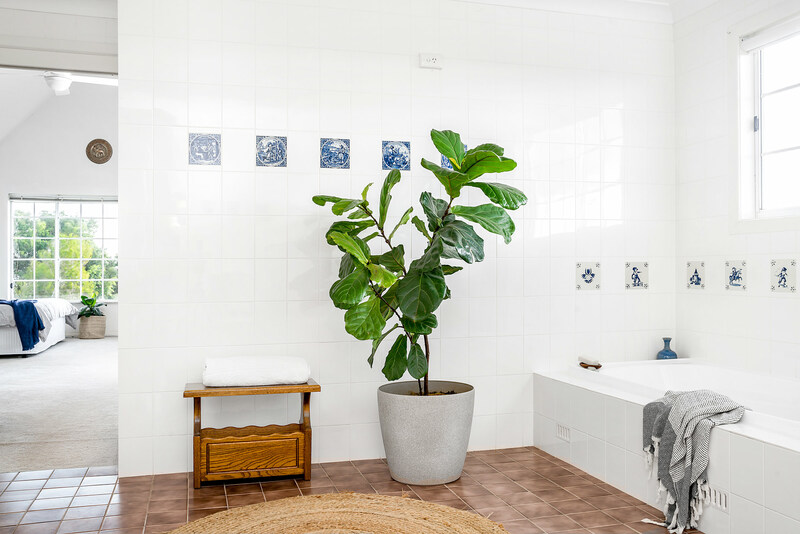 The master also has an ensuite with shower, hinterland views, and access to the back porch through sliding glass doors. 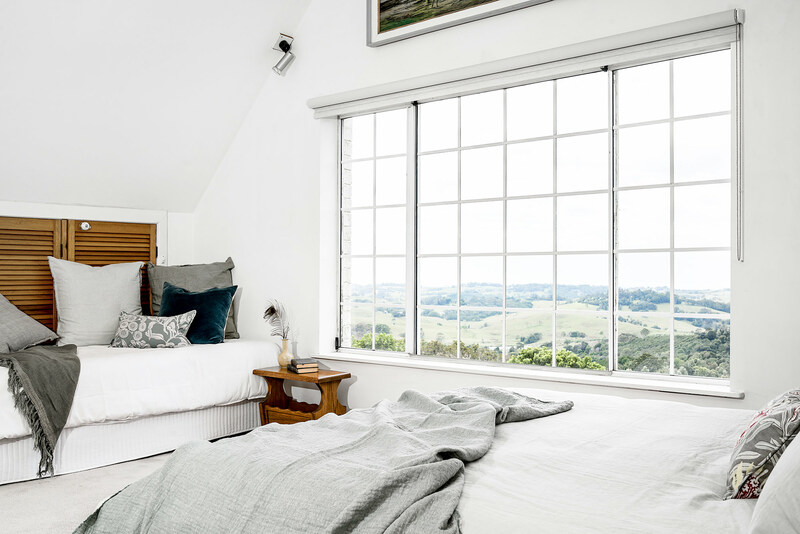 The second downstairs bedroom has 2 single beds (which are not suitable to be made together) as well as large windows with hinterland views. 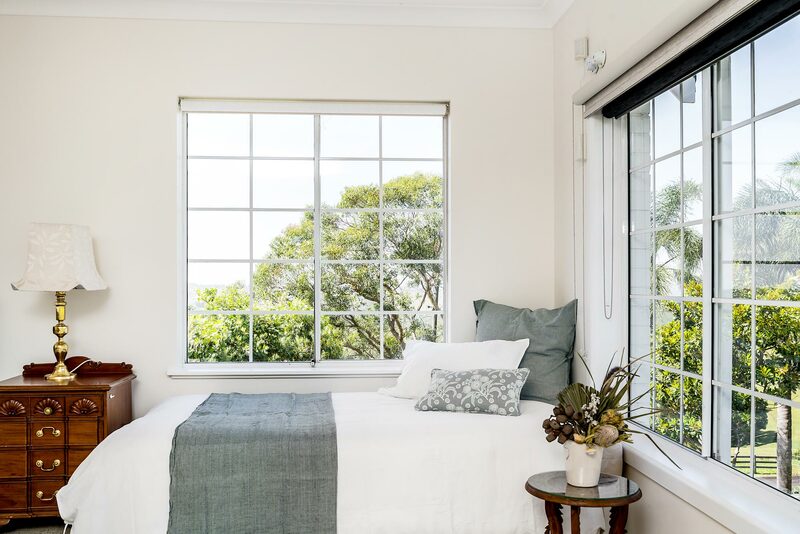 The fully air-conditioned upstairs bedrooms are enormous with extra beds for small families to stay together. One bedroom has 1 queen, 1 king single, and 1 single bed. The 4th bedroom has 1 king bed, with space for an additional hire trundle and/or hire cot, available on request. 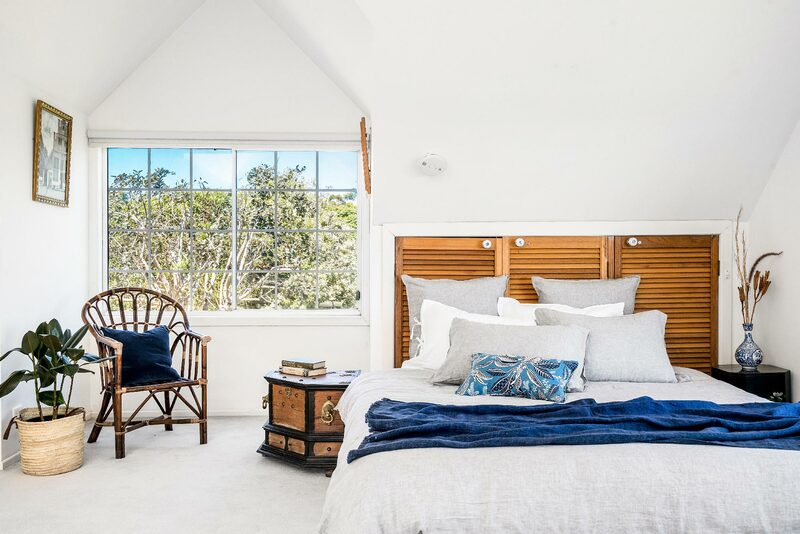 The upstairs bedrooms boast incredible ocean views and share a large bathroom with separate shower and tub. 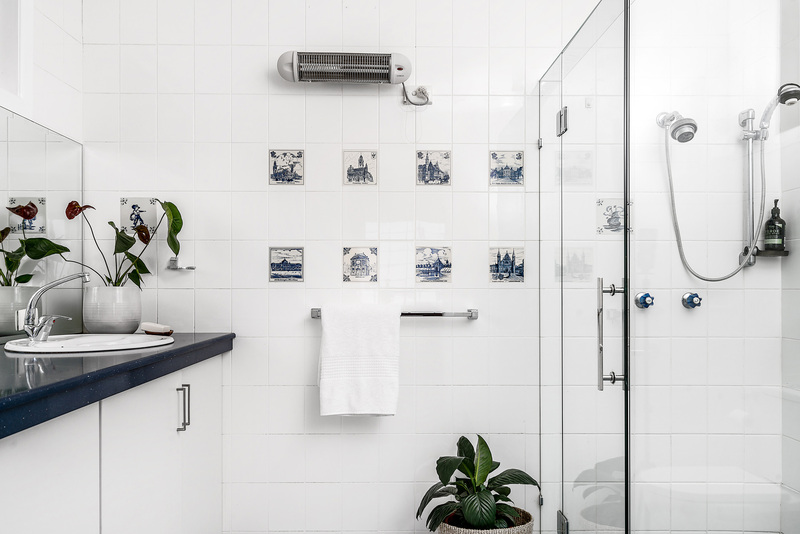 Nicely appointed with modern fixtures and vintage tilework, the two downstairs bathrooms include a master ensuite with shower and toilet, as well as a shared bathroom with shower, toilet, and laundry facilities (accessed from outside). 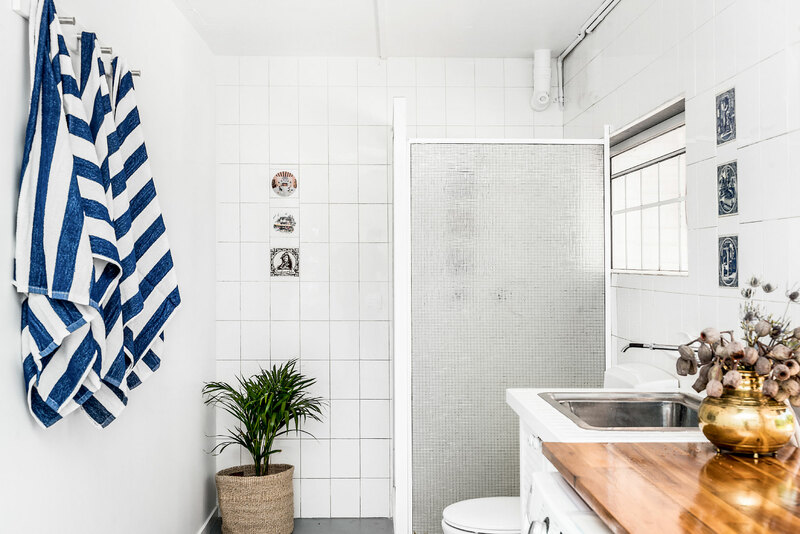 A third, shared bathroom upstairs is similarly styled with a shower, separate bathtub, and toilet. 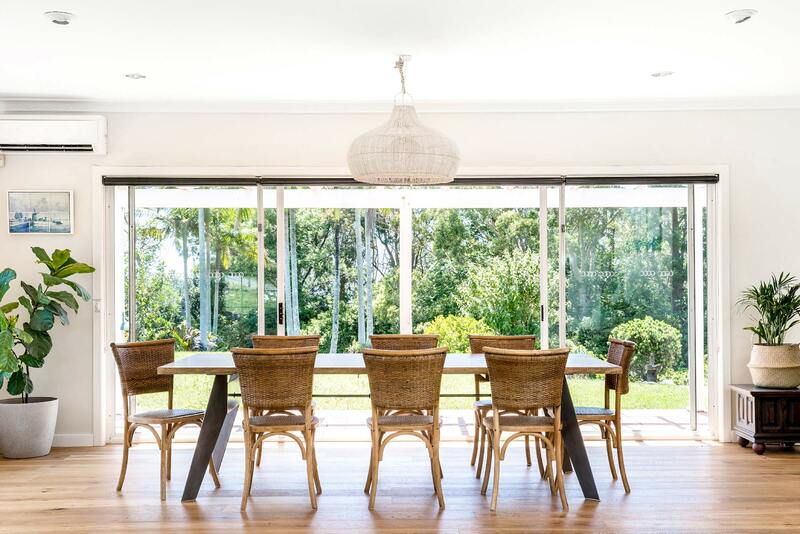 A charming, pergola-covered back porch faces toward Byron Bay, providing endless views of the ocean and hinterland. 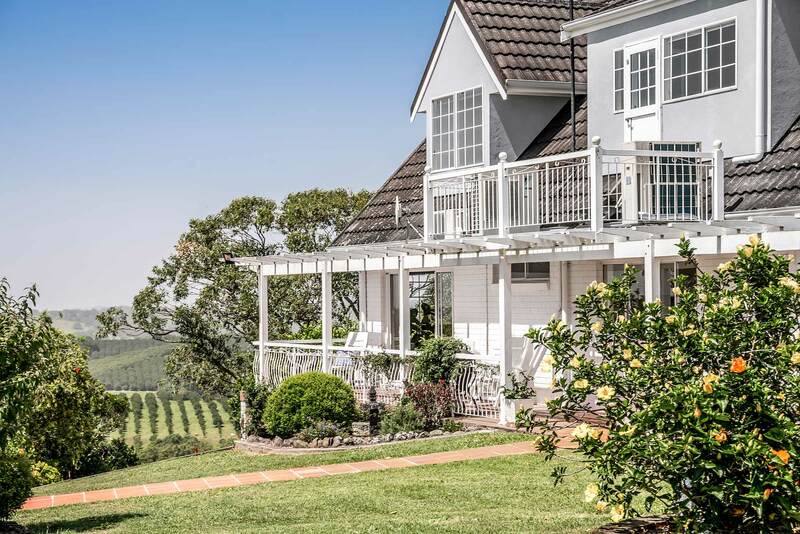 There is a BBQ provided along with café-style seating, perfect for enjoying a glass of wine and watching the sun set behind the hills. 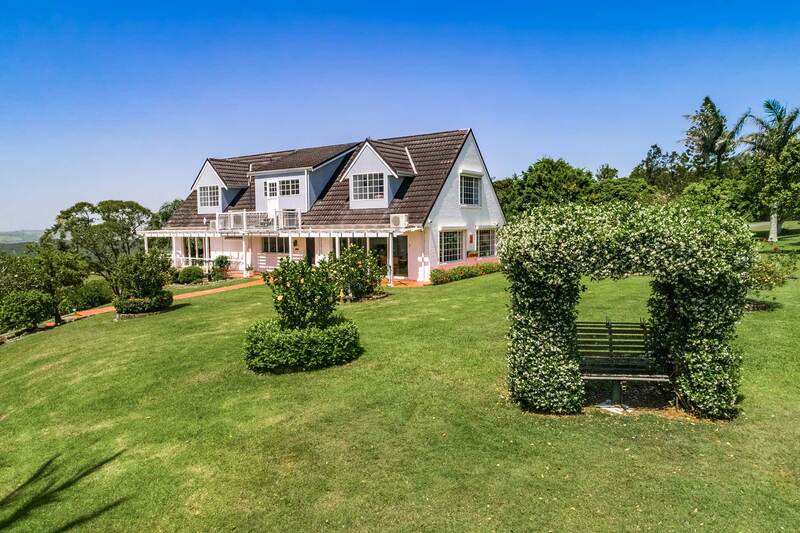 Perfectly manicured lawn rolls along the length of the property interrupted only by blooming gardens and lush greenery. 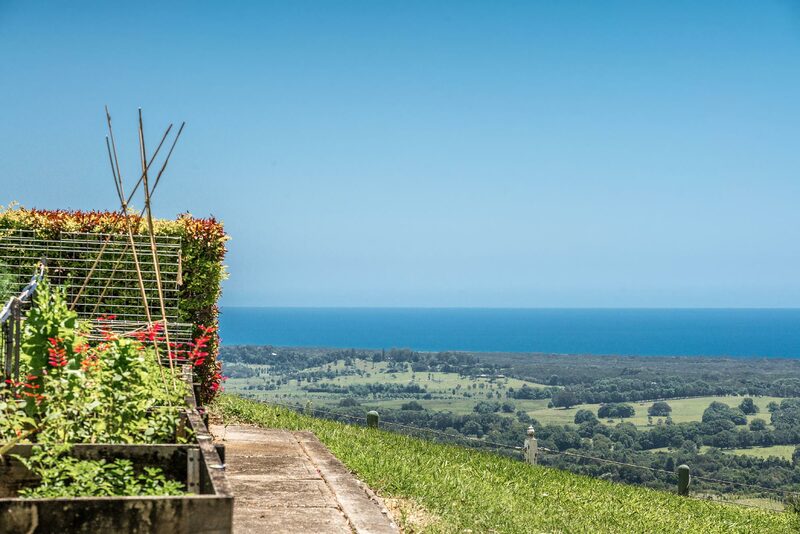 A paved pathway leads down to a vegetable patch with picture-perfect views, where numerous herbs are grown for you to pick and cook with. 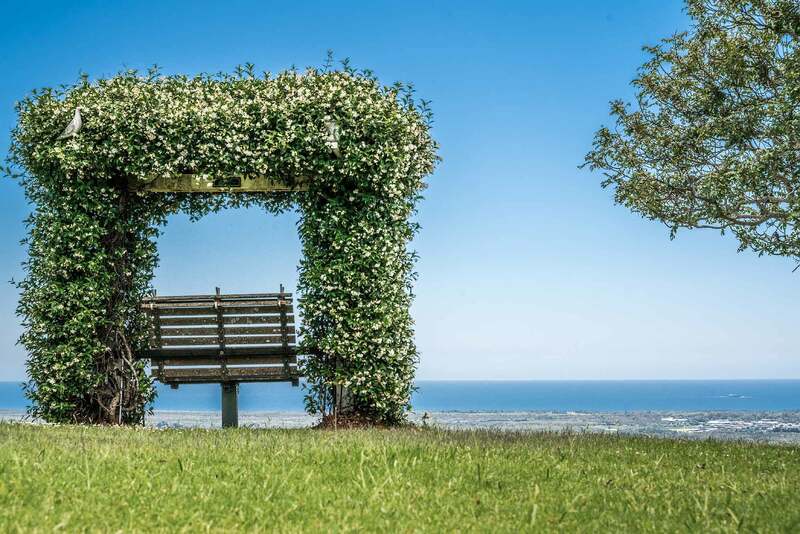 At the edge of the property is a special place for peaceful reflection, a quiet bench surrounded by an archway of flowering Jasmine and serene ocean vistas. There is parking available for 4 cars off-street. 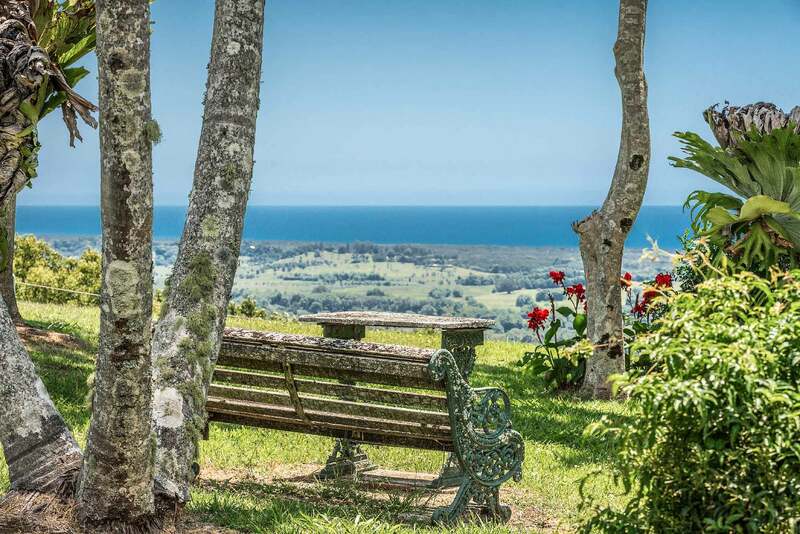 Just a quick drive down the hill from Pacific Ridge is the charming village of Bangalow. This friendly place is home to a weekly farmers market, monthly craft market, award-winning restaurants, and numerous local boutiques selling designer décor, homewares, clothing, and accessories. 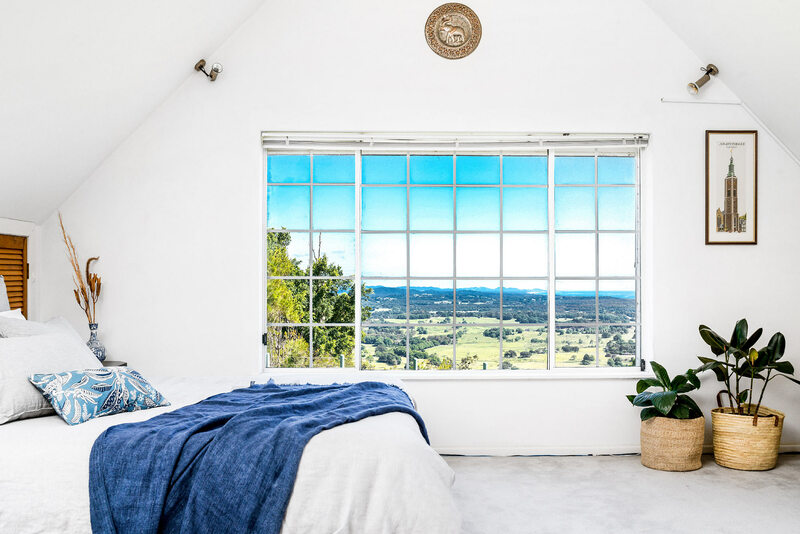 Beach lovers will delight in the short, 10-minute drive into the centre of Byron Bay, where world-famous surf breaks and pristine, white sands are found in abundance. 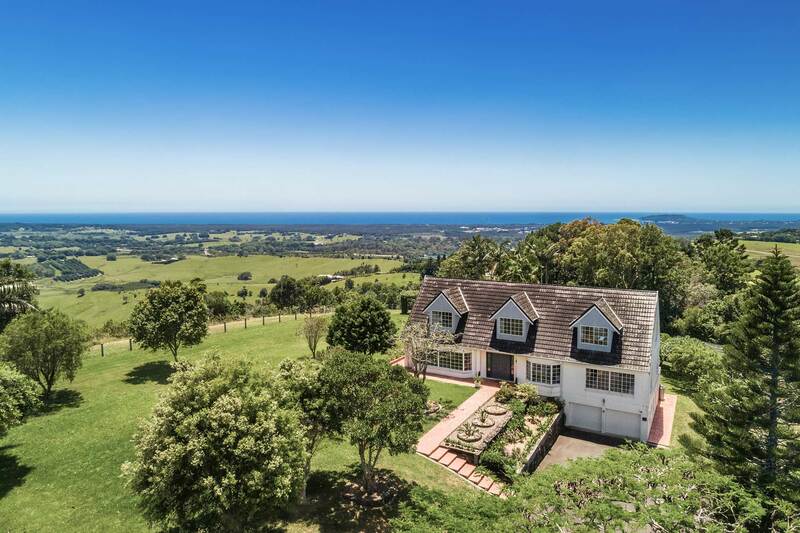 Enjoy a scenic hike up to the Cape Byron Lighthouse or take part in an exciting whale-watching excursion! There’s more to love in town, where visitors are equally welcome at hearty brekkie spots, cool coffee shops, gourmet dining, and hip bars. 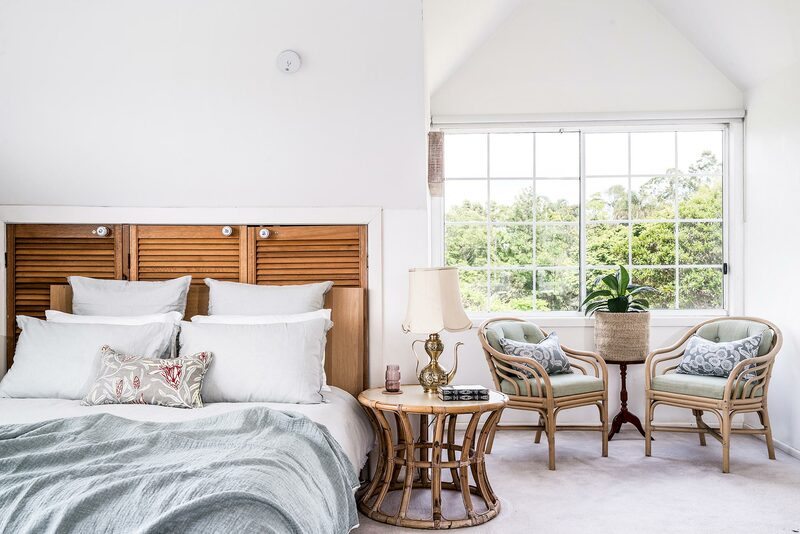 Shop designer boutiques or indulge in world-class spa treatments, then return home to Pacific Ridge to enjoy the added space and privacy of your comfortable family retreat in Byron Bay.